While I've never seen the big guy myself, I assume Santa's sleigh isn't as graceful as most think. Taking off just to land at the house next door, he must look like a learner driver, bunny-hopping down the freeway, despite his decades of joy bringing, ho-ho-hooing experience. 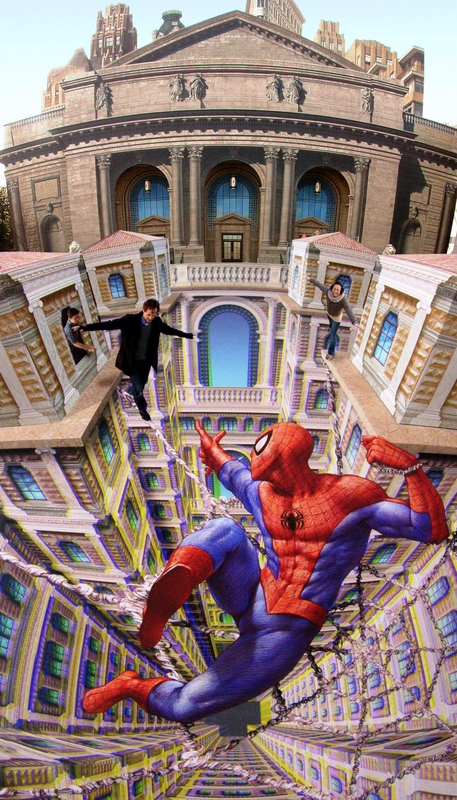 Now in the promotion of his book Asphalt Renaissance, former NASA employee turned pavement artist pro, Kurt Wenner, has released this 3D street drawing of Spider-Man, that actually allows you to walk the wall crawlers webs. Having been in the game since 1982, walking on said web or art should almost constitute a crime, let alone be off bounds to a jolly old man and a sets of stop-start reindeer hoofs. Put Asphalt Renaissance high on your New Years reading list. Get it from Amazon here. HOLY COW!!! This is amazing! I might steal this and post it on facebook! That is a nice drawing! I won't steal it tho. Thanks for the comments Jimmy Don and Pensol! It as mind bowing isn't it? Mind you if I finished a piece that epic and after I felt the first few drops of rain, I think I'd turn Green Goblin level insane!